I enjoy opening this product even if you only get about five or six cards. For $45, I feel as though I get the bang for my dollar. Today, I opened two 2007 Sweet Spot tins. I'm one of those people who enjoy getting surprised. I try to go as slowly as possible when looking at the best card because I want to savor it. On the first Sweet Spot card, I look at one corner. These cards show the stadium of the player that is on it. I see a Yankee NY and get a little excited until I realized it was saying Bernie Williams was up to bat. I look at the left corner and see the Green Monster. This is the second time I've ever opened of Sweet Spot and had a Red Sox player both times I pulled a Jason Varitek numbred to /45 the first time. I open the second tin. As I look at the side of the pack, I notice there are no base cards in this pack. So, the first card on top of a Jason Schmidt patch card numbered to /25. I didn't scan it. Now, it's time to look at the Sweet Spot card. I look at the right-hand corner. I can't tell the stadium. I look at the left-hand side and I see Comerica Park. At this point, I was done waiting. Not a bad card. The regular jersey cards from the two tins were Miguel Cabrera as Marlin, Randy Johnson and Jim Edmonds. The rookie autos were Baltimore's Jon Knott and the Marlins' Rick Vanden Hurk. By the way, in the first tin I opened with the Varitek card, I also got a redemption card for a Delmon Young/Akinori Iwamura dual signed card /15. Sounded good until I got the card a few months ago. Here's the faded dual. This is how it came. One day I'll pull a Jeter. One day. If I don't have that card (I have three Miller Sweet Spots) a trade is in the works!!! Those are actually 2 of the better tins I've seen opened. 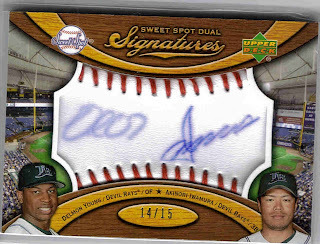 Most of the time you just get a base Sweet Spot baseball leather #'d to 199 or 299. So to get 2 parallels with ridiculous low numbering is huge! And that patch, even though it was Schmidt, is a 2 per 20 tin case hit. I wish any of the 4 tins I've opened was as good as 1 of yours! Even though I know you don't like the Sawx, that Papelbon should bring more than what you paid for the tin on eBay.